Summary: This walk is a serious undertaking but the rewards for making the effort are more than worthwhile. 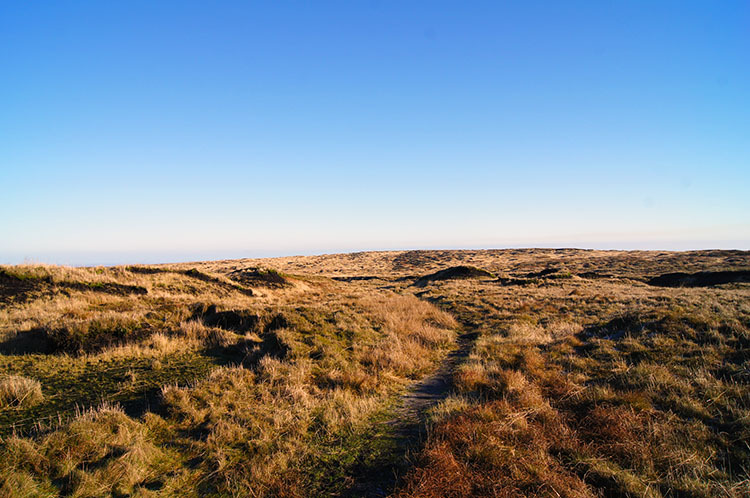 Bleaklow has a reputation for arduous walking, Wainwright describing the moor as an inhospitable wilderness. Do not let the ill gained reputation put you off, just pick a decent day such as I did and you should enjoy the thrills I had on the moor which included my first ever close encounter with a Mountain Hare. There is also a poignancy to this walk as it visits an aircraft crash site which claimed 13 lives. On a good day such as mine the views are exceptional, another reason to take on the walk. 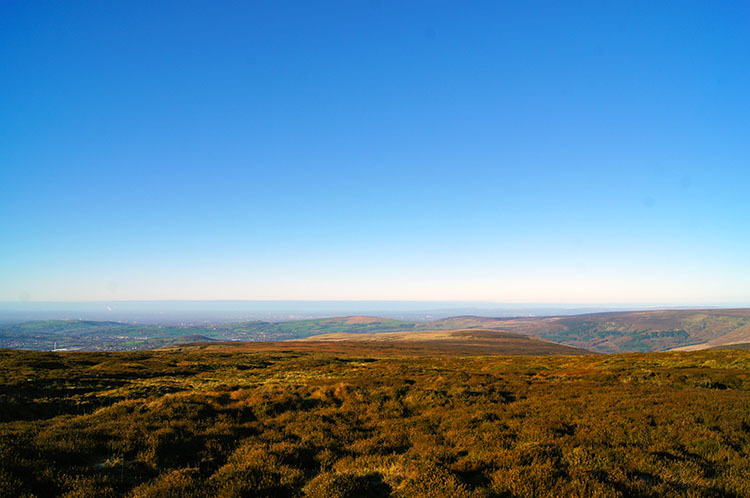 The Walk: In my premier category of mountain, hills and moors Bleaklow had always been high on the outstanding wish list. After leaving it far too long I finally got around to planning Bleaklow and some other yet to walk moors of the north Peak District/ South Pennines area in Autumn of 2014. Having done some of the other walks first I had to wait over two weeks more for a suitably clear day in which to explore Bleaklow. The day arrived. It was into December and the daylight hours were short so I had to make an early start. I was up at 6.00am, on the road before 7.00am and parked up in the United Utilities car park at Torside before 8.30am; my car being the only one in the car park. I walked from the car park on a meandering path through young woodland to meet the Longdendale Trail/ Trans Pennine Trail which I followed west. 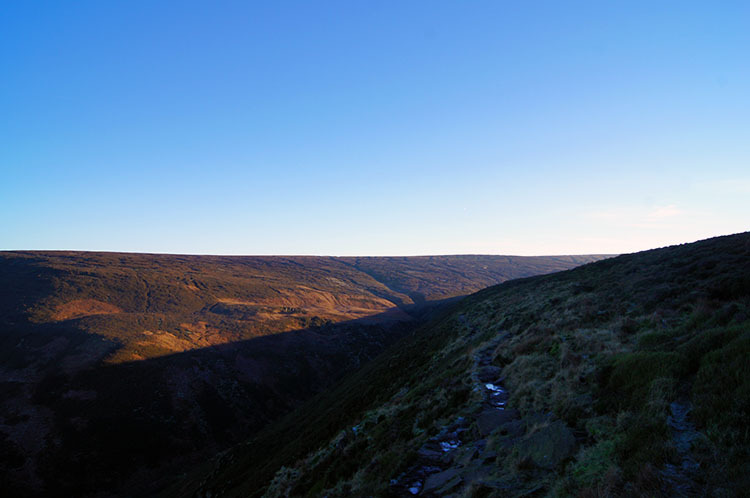 Looking to my left I could see Torside Clough opening out for me, revealing the path I would take up to the moor. It was the dark side for now. 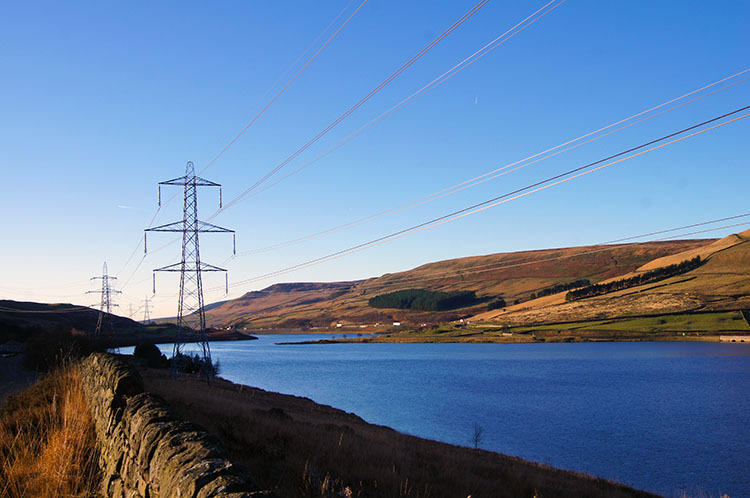 Looking to my right across Torside Reservoir I could see the hills bathed in bright morning sunlight. It was much lighter over there. 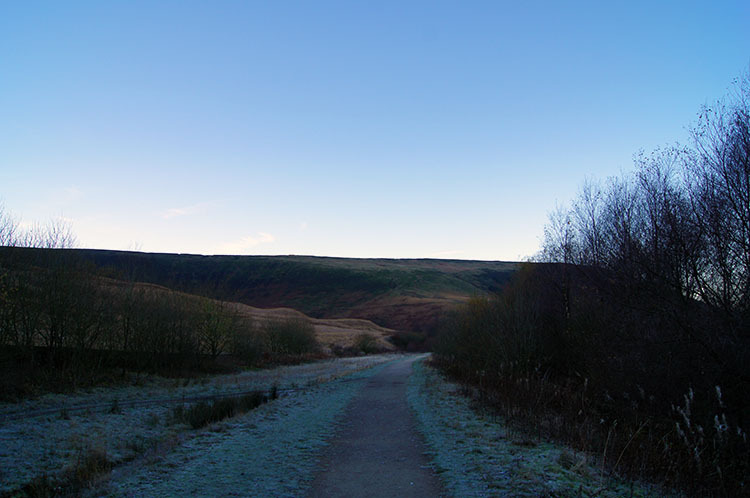 I continued walking in my frosty shade and after 15 minutes walking I left the Longdendale Trail/ Trans Pennine Trail to follow the Pennine Way towards Reaps and uphill on the western edge of Torside Clough. I was searching for the sun which continued to hide from me as I climbed. I climbed as fast as I could, wanting the sunshine on my face. Every time I stopped to take a photograph, read the map or check the GPS location my fingers stung with the pain of the cold. I did not linger in my observations, quickly pulling the cloth of my mitten gloves over my fingers to feel them once more. The climbing helped though as I maintained decent lung stretching exercise, stopping only briefly and reluctantly to catch my breath. 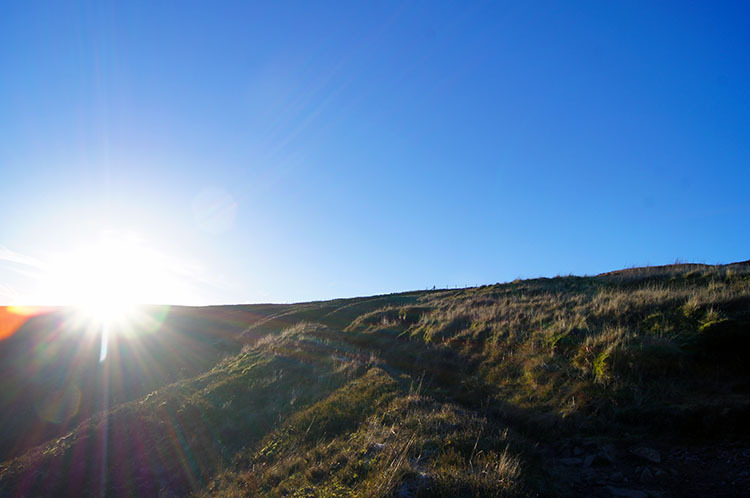 On the pauses I looked back over my shoulder to the south and envied the sun kissed south facing slopes across the north side of Longdendale. 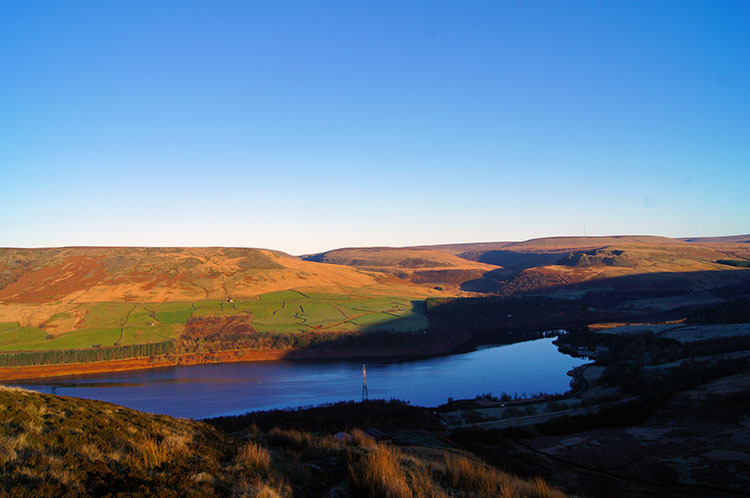 I noticed that as the sun sunk further into the valley that both Woodhead Reservoir and Torside Reservoir were getting their first sun kisses of the day. At around 400 metres I finally reached the sun. It instantly baked my face as it hit and I was forced to raise my hand to shade my eyes. It was a fantastic moment though, being bathed in sunlight always is, especially when it is low in the low sky and forcing one to pay it attention. 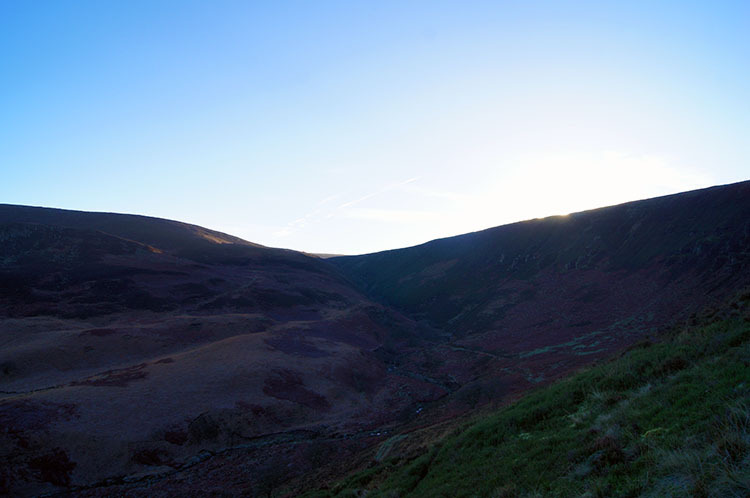 The first encounter with the sunbeams was only temporary though as I lost it while rounding Torside Clough from the direction south to a course east. 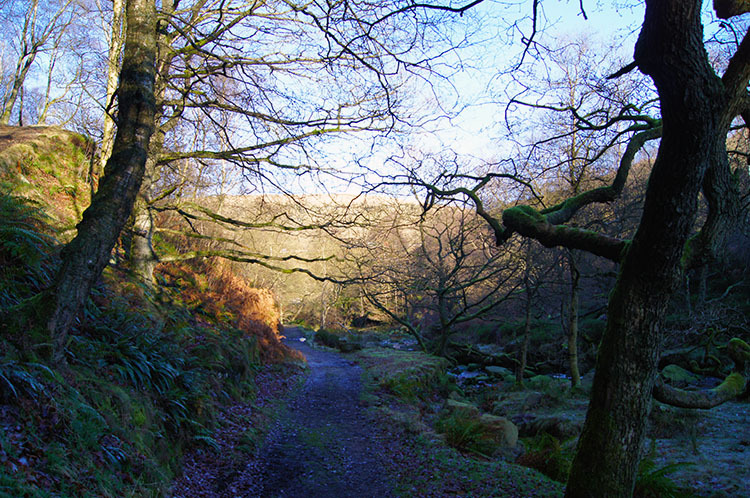 The Clough Edge track following the Pennine Way continued eastwards for a mile before turning to the south once more. For that mile I was back in shade. On turning to a south course again I was nearing the head of Torside Clough. I came to a point where the Pennine Way turned east once more following Wildboar Grain. Here, should I follow the Pennine Way I would have been led to Bleaklow Head but that was for later. I had resolved to cross over Joseph Patch and Shelf Moss to Shelf Moor and one of the most extensive air crash sites in the Peak District. 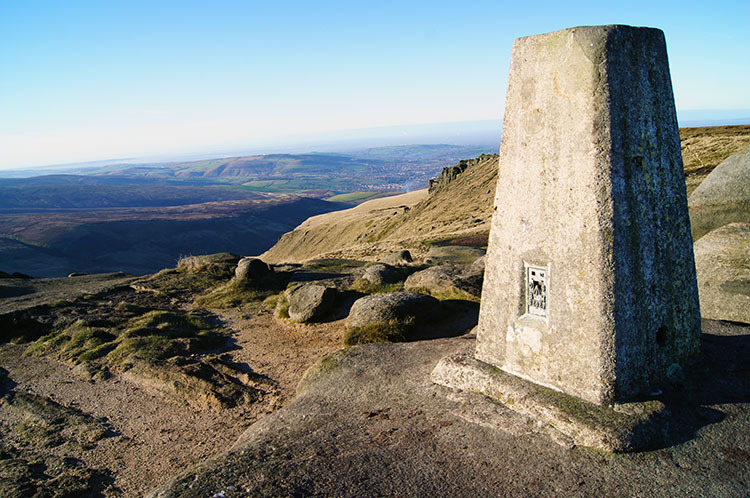 I also wanted to attain the trig point on Shelf Moor. So I left the Pennine Way and tracked south east. At least I was permanently in the sunshine now. 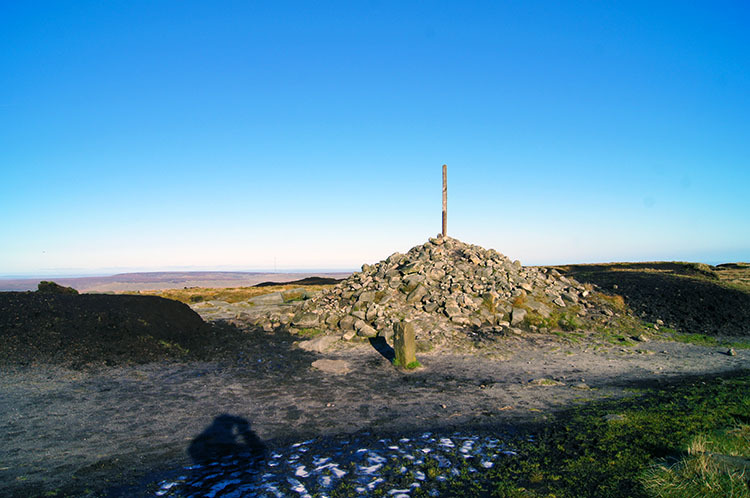 On Harrop Moss I looked across in a north-west direction to the Manchester area which was brightly lit in the December sunshine. The walking was easier than I had expected and had been warned. 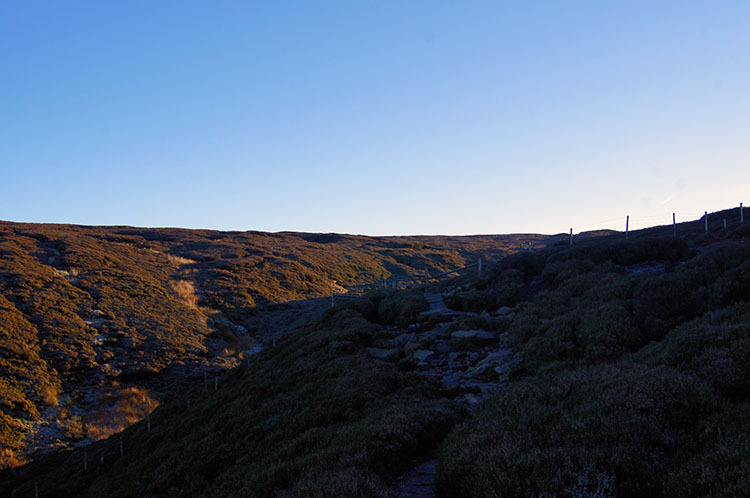 Reading Alfred Wainwright's Pennine Way Companion he had said of Bleaklow "an inhospitable wilderness of peat bogs over which progress on foot is very arduous. Nobody loves Bleaklow. All who get on it are glad to get off". I had to disagree with his synopsis. I was crossing the very same ground and though climbing down into Peat Hags and up out of them was hard work it was all part of the experience. And the uneven ground threw up occasional surprises. Very often Grouse flew out from nearby hides, something I am well acquainted with. But then something happened which, despite my long experience of walking in the uplands, had never happened to me before. It was almost like a blur. I stepped around a Peat Hag corner in tussocky knee length grass when this pure white object sprung out right in front of me. I almost stepped on it but before I could assimilate what was happening the white object had run 100 metres. Fortunately it stopped within view and I caught a good few moments of it in a stationery position while it surveyed the ground for its next move. 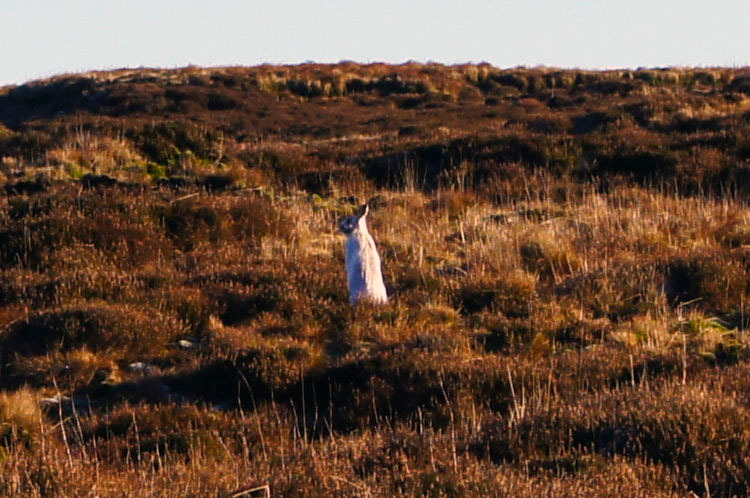 It was a Mountain Hare, a perfect white camouflaged one. What a WOW moment for me, not just the photographic capture of evidence but the whole experience. If I had taken one step in another direction it might have stayed in cover and I would have missed it altogether. Such luck for me, a darned inconvenience for the Hare. Not long after my encounter with the Hare I passed Hern Stones and reached the site of the air crash I gasped for breath as soon as I saw the extent of the wreckage. 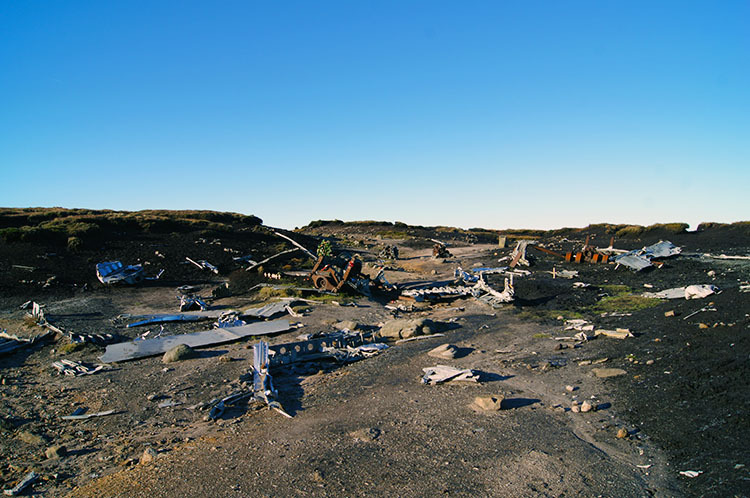 I have seen air crash sites on my walks several times before, one not far from here on Burnt Hill near Kinder Scout. But I had never seen anything of this magnitude. The wreckage is of a United States Air Explorers Super-fortress It was on a routine flight from Scampton in Lincolnshire to Burtonwood in Warrington. All 13 crew members died. I was very moved by the experience of walking across the crash site. 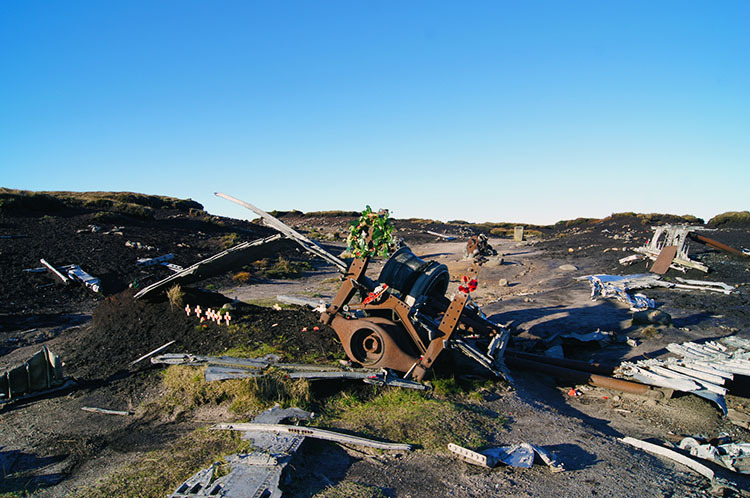 The impact of the crash is all too evident to see as remains of the plane are spread over a wide area of Shelf Moor and ironically the crash site is very close to the summit of the moor where a trig point sits with a lovely view point, particularly to the south of Higher Shelf Stones and Glossop. After my experience of the crash site I took a break and sat on one of the stones near the trig point to take refreshments while looking down towards Glossop. 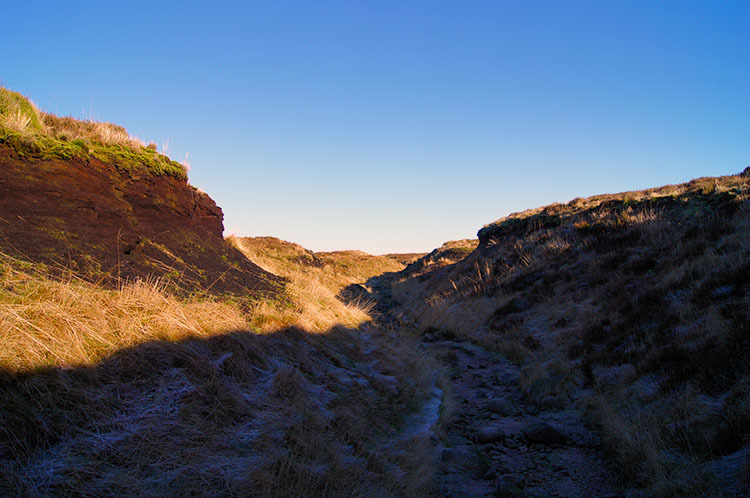 My next challenge was to forge a route from Shelf Moor to Bleaklow Head. There are no paths on the map and no obvious paths from the trig point but I knew by tracking north-east I would meet the Pennine Way. And so I did but on that roaming pathless section I had two more encounters with bolting Hares. The first occasion was interrupting a pair of Hares and the second a solitary Hare. None of the three were as white as the first though, not quite in complete winter coats but in reality more camouflaged than the perfect white beauty I had come across first. After climbing in and out of more Peat Hags to reach the Pennine Way the characteristic of my walk changed. The Pennine Way meandered around Peat Hags but managed to stay in then entirely. If the wind had been howling it would have blown straight across the top and I would have been relatively sheltered. This day though I was simply sunken about six feet below ground level following the National Trail. Anyone stood on top of the peat hags on the moor would not have spotted me on my subterranean journey to Bleaklow Head. 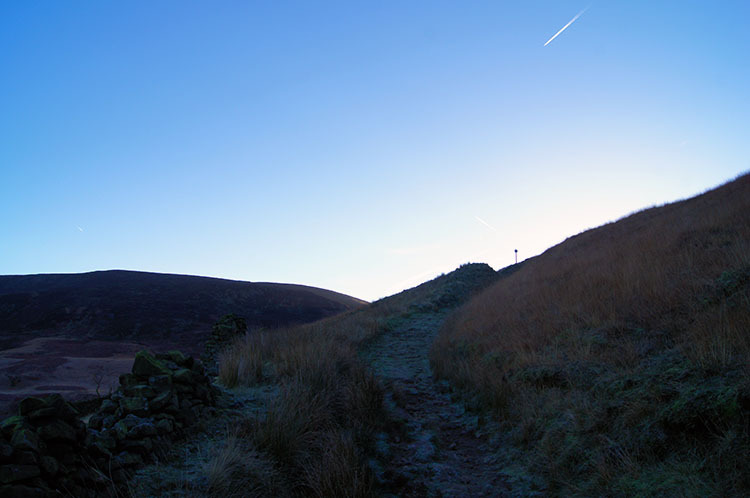 Just before reaching the cairn the Pennine Way came out of the earth and to the level ground. Now I would have been spotted by searchers. I did not stay by the cairn for long as I had taken a break on Shelf Moor only a half hour earlier. I reassured myself of my location on the map and with the GPS, potting my course from Bleaklow Head to Black Clough. Though no path showed on the map a clear path showed on my way of going. I followed it north-east. For the first 100 metres it was an obvious well walked path. For the second 100 metres the path split at points where the moor, in constant change, changed its character from firm to bog and from level to sunken. 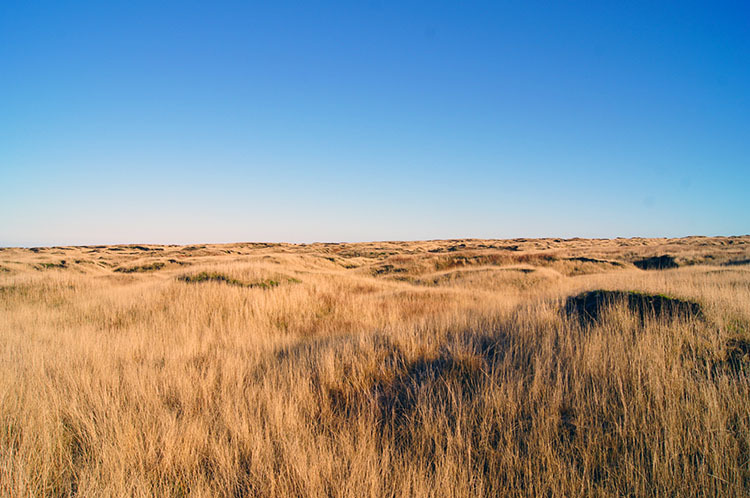 Long fawn coloured grasses became more prominent. Tracks led in several directions. Which one to take? I kept to the ones closest to my directional course. After about another 250 metres of meandering and searching for clues I spotted the developing depression which was the head of Black Clough. This would lead me all the way to Longdendale and in a short distance along it I would surely be able to make out the clear path. No such worries, the pioneers of the moor on earlier walks throughout the years had forged a good path on the west side of Black Clough. I followed it without a problem. 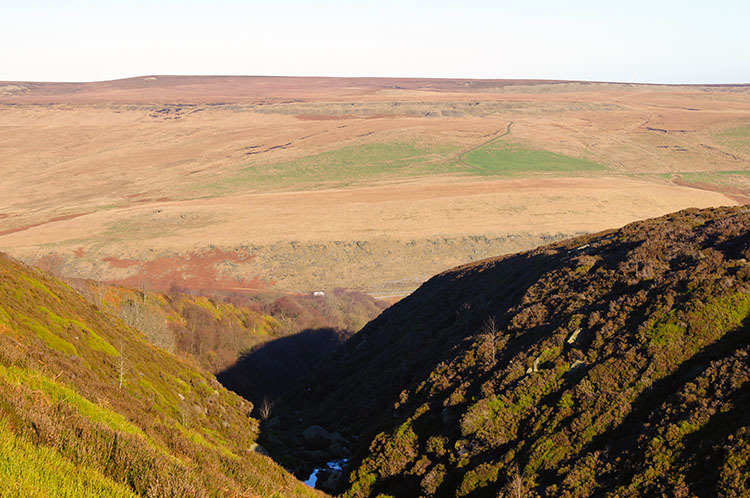 In fact, I found Black Clough such an enjoyable experience that I took a second time out half way along the two and a half mile length of it and sat down, alone with just the Clough and immediate moor for company. I listened to the trickle of water filling the clough below. It was music to my ears. Then I started walking down off the moor via Black Clough and as I did so the sound of the watercourse was replaced by the hum of another kind. 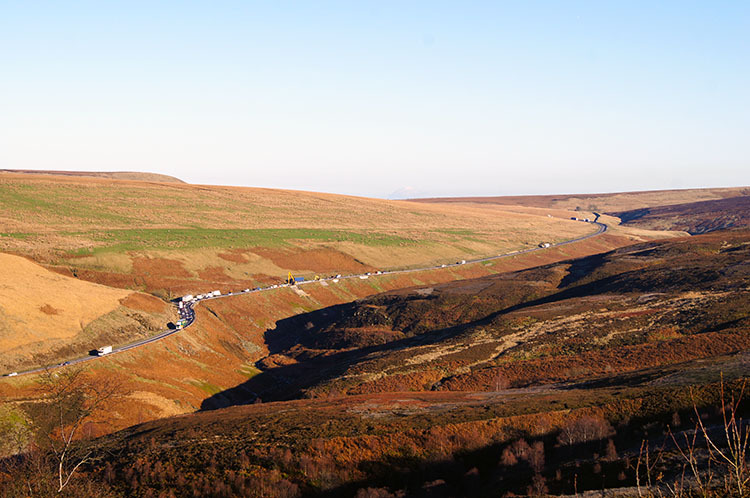 The traffic of the A628 Woodhead Pass crossing the Pennine Divide was making itself heard. 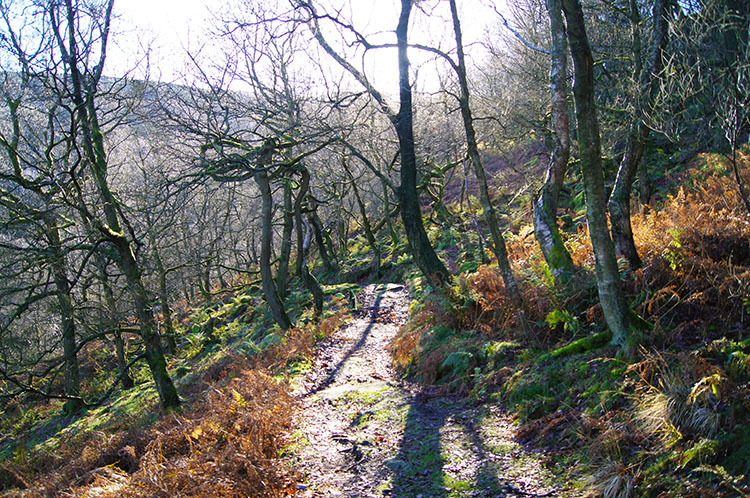 After my two and a bit miles walking down the path parallel to Black Clough I reached Birchen Bank Wood which heralded my final descent from the moor. Walking through the wood temporarily drowned out the sound of the traffic as it took me down to the Black Clough waterline. From the waterside I followed Black Clough on its final stretch downstream to where it poured into the River Etherow. 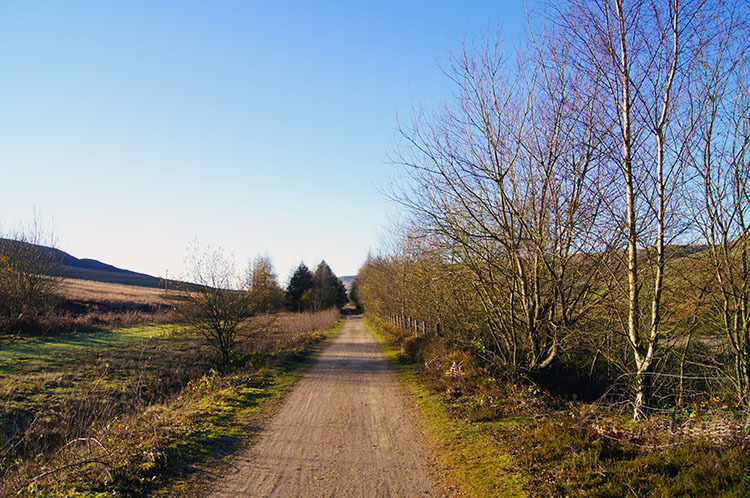 It was a delightful short section of walking, the prelude to my long walk along the Longdendale Trail back to Torside. I still had three and a half miles to walk. I was not particularly looking forward to the long walk back along the Longdendale Trail after the excitement of the moor but the three miles of flat walking on the straight path was compensated for by views to the reservoirs and hills on my right and the north facing slopes of the Bleaklow mass to my left. Been up there, done that, and what an experience it was I thought as I walked along. I also looked up to the sky. Thank you for keeping the clouds at bay today. it made everything perfect. And one final thought as I strolled back the track to the car. The brilliant white Mountain Hare; you were a very special encounter.